I welcome visitors to my studio but do advise you to book an appointment first. This allows me to set aside time for you. At the studio you can use the equipment to make up your backing and cut your binding. I am very happy to help you with this and to go over the check list below with you. 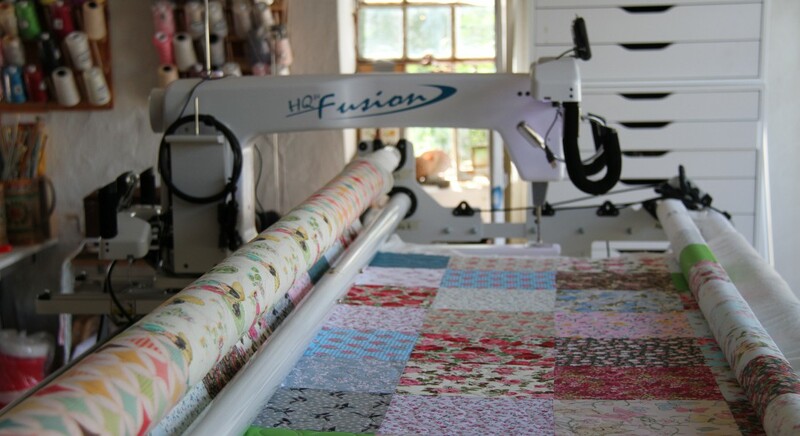 The studio has sewing machines, rotary cutters and mats and a lovely big table to work on, as well as everything you will need for quilting. Here is a checklist of things to be aware of before you send me your top. Your backing and batting both need to be at least 15cm larger than the top around all sides. Trim any selvages and press open seams on backing joins. Trim all loose threads so that the dark threads don’t show under light fabric. Square up your quilt top and backing. If the quilt is directional, pin a note to indicating the top. Remove any embellishments i.e. buttons or beads as this can damage the machine, they can easily be attached after the quilting is finished.